Color ranges from black to reddish-brown, though typically uniformly dark in appearance. When excited or disturbed, the acrobat ant workers run about with their abdomens held high above their heads. When they are viewed from above, the abdomen is heart-shaped. Like most ants, acrobat ants establish well-defined trails between the nest and food and water sources. 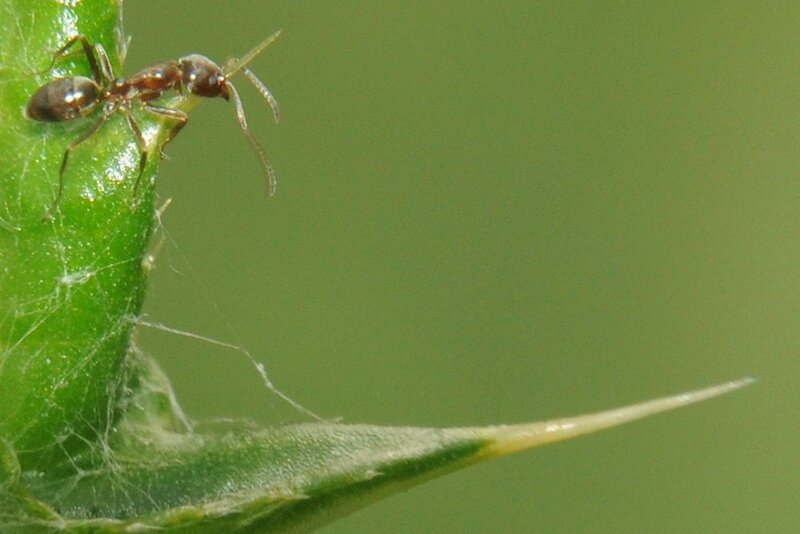 Fruit trees, roses, and many shrubs serve as hosts for aphids and may contribute to ant infestations in buildings. If acrobat ants come into a home, they prefer sweets and meat. Color varies from dark brown to black and the body is often shiny in appearance. Colonies are massive and may contain hundreds of queens. 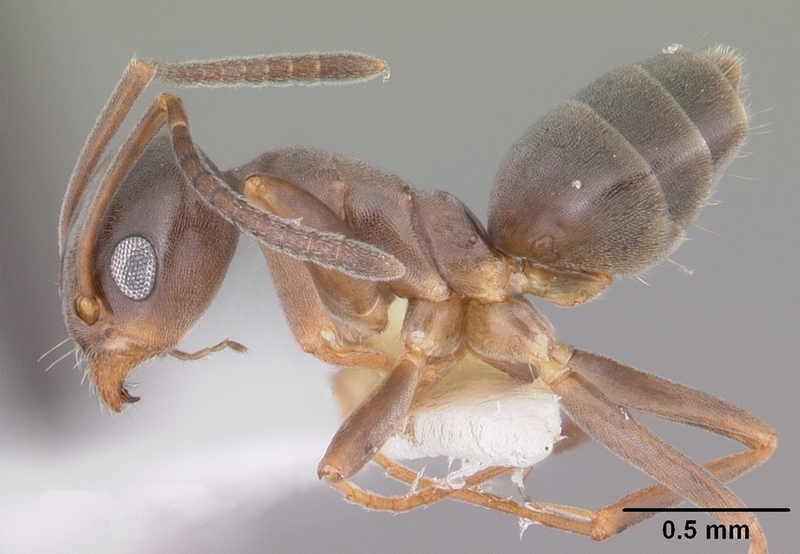 Argentine ants are very aggressive and will drive out native species of ants; however, members of two separate colonies are not aggressive toward each other, allowing for multiple colonies to combine. These colonies can populate entire city blocks simultaneously. Nests are usually located in moist soil, next to or under buildings, along sidewalks or beneath boards. These ants travel in trails, foraging day and night. Color varies from brown and black, red and black, to light brown depending on the species—black being the most common. They are active year-round, but in the spring, mature colonies produce winged reproductive ants, called swarmers, that fly out to start new colonies. These swarms often occur from satellite colonies within homes, so homeowners may see large flying ants in their homes at night. They reside both outdoors and indoors in moist, decaying, or hollow wood and can leave “sawdust” behind as a sign of their presence, which is sometimes confused for termite frass. Instead of eating the wood, as one might assume, they cut through to provide passageways for movement. 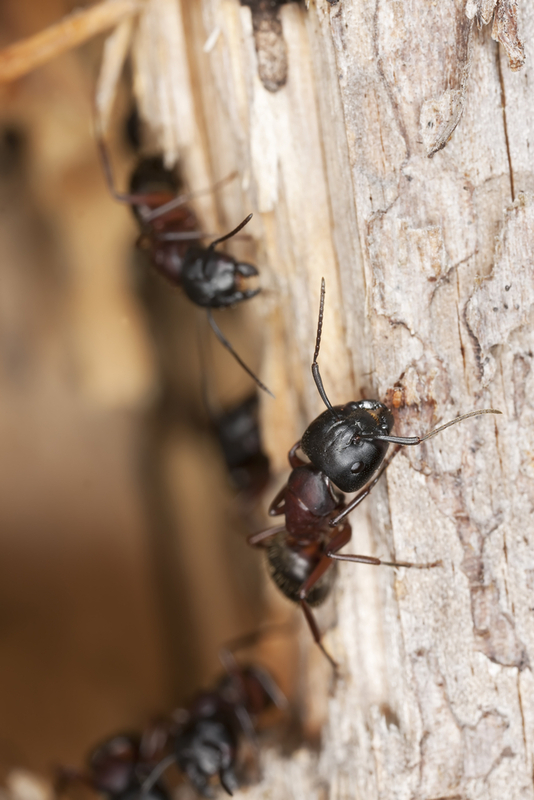 Carpenter ants feed on a wide variety of foods, including other insects. They prefer to eat anything a human might eat—especially sweets and meat. Color ranges from dark reddish-brown to black, most typically dark red-brown in appearance. When crushed, they give off a very unpleasant odor, for which it is named – usually described as rotten coconut. Because odorous house ants tend to forage inside homes, they can easily contaminate human food supplies. They may be difficult to control and do not feed much on ant baits. The keys to control are to find the colonies and subcolonies and treat them directly. Outdoors they prefer honeydew from aphids and mealybugs. When the honeydew supply is reduced in autumn, they often move indoors for food. Indoors, they eat meats, sugary foods, dairy products, and cooked or raw vegetables. Color varies from light brown to black with appendages lighter than rest of the body. Pavement ants enter buildings throughout the year while foraging for food. They will feed on a wide variety of foods, including meats, grease, live and dead insects, seeds, and honeydew from aphids. Nests are outdoors under stones, along curbs or in cracks of pavement. Pavement ants also dwell in the undersides of logs, bricks, stones, patio blocks and boards. Workers enter houses to forage and can become a nuisance when large groups infest a kitchen or garden patio. They are not typically aggressive, but they can sting and bite. Color ranges from light yellow to red with black markings on the abdomen. Pharaoh ants have multiple queens and are able to move their colonies from place to place when disturbed. They typically establish themselves in areas near moisture, such as the kitchen or bathroom. They travel from room to room within the walls via plumbing pipes and electrical wires. The pharaoh ant relies on artificial heating in buildings to survive. Infestations commonly occur in food service areas and they will nest in any well-protected and hidden areas throughout a structure. Hospitals and food service frequently require control for pharaoh ants, as they can quickly spread disease and contaminate sterile equipment and rooms. Color varies from golden-yellow to brown. They are among the smallest of ants. Thief ants derive their name from their habit of locating their colonies close to those of other ants to steal that ant's food and even capture and eat the other ant's eggs and larvae. They are also attracted to greasy or high-protein foods, such as cheese, nuts and meat. Colonies are usually small and are difficult to find. In homes, trails are often seen in bathrooms and kitchens and in and around windows where the ants can find moisture and food. 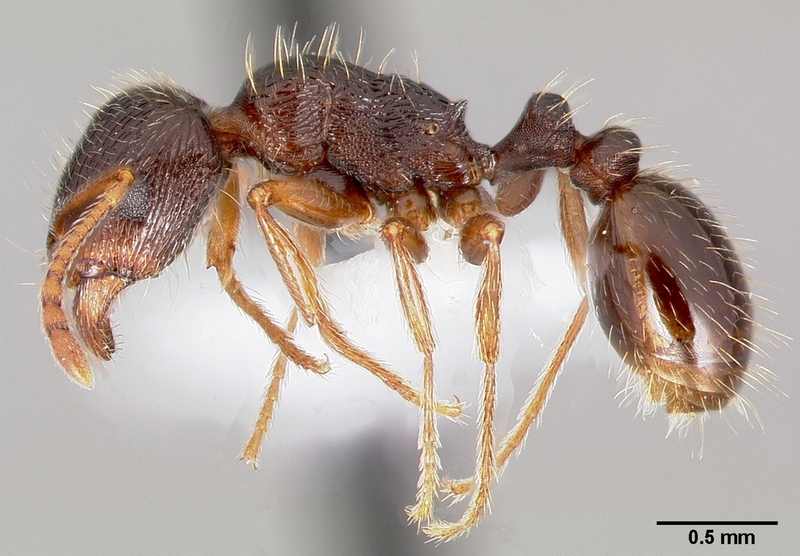 Thief ants nest in rotting wood and soil. They may also nest indoors in small spaces, including wall crevices, cabinet voids, under countertops and behind baseboards.